Today's shot is from my Guide to Composition video, it is the Chevron statue along Chicago's Lakefront. 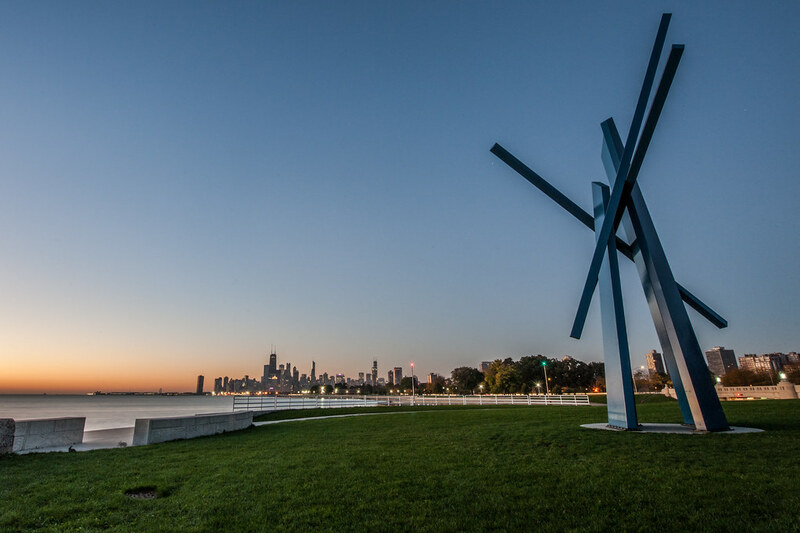 The artist, John Henry, had originally put this sculpture on his lawn, and received a number of complaints from neighbors before it was finally moved to its permanent home along the lake. Personally, I think it's a pretty cool statue and looks good in its new spot. The controversial Chevron statue along Chicago's Lakefront. I really never thought I would see the day that the Wrigley field marquee read "World Series Champions". Yet here we are, and it all still feels surreal. Perhaps the most amazing part about it is how easy it felt. A change of ownership, and a willingness to pay for the top players. Bringing in the brightest young mind in baseball in Theo Epstein, and of course the best manager in baseball in Joe Maddon. We built around young talent, and made a few big name veteran acquisitions in free agency. We were so bad, cursed even, for so long and it all changed like that. What a cool thing to be a part of, but it still doesn't feel real. 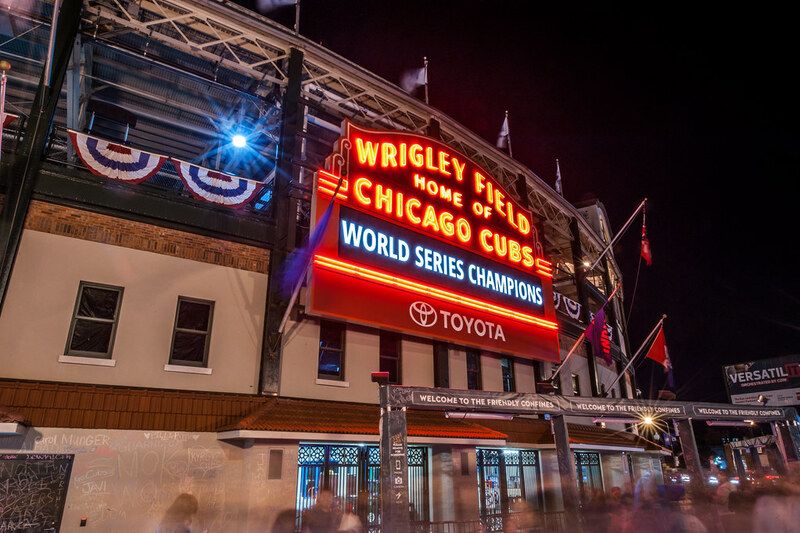 I never thought I would see the day that the Wrigley Field marquee said "World Series Champions". If you've been following my photography for any period of time you'll know that this is one of my favorite spots in Chicago to photograph. 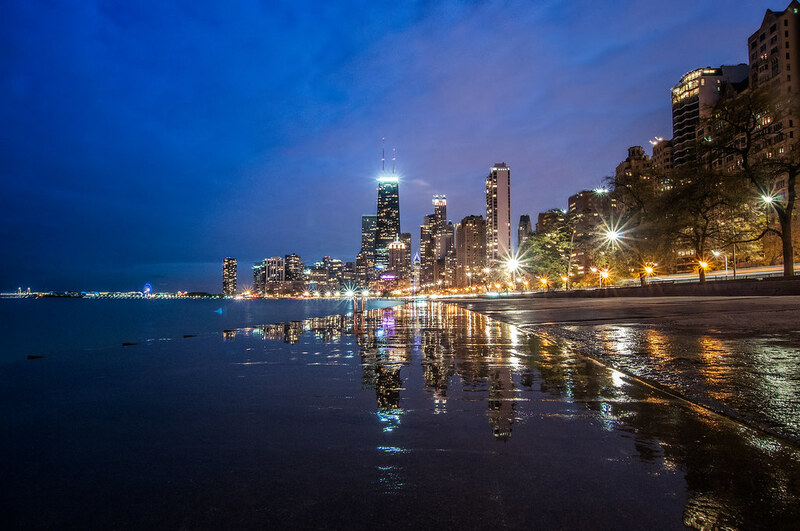 First, it is pretty close to home, and also because it's along the Lake Shore Path, a perfect spot for ShutterRunning. This was shot with my backup or running camera, a Nikon D5000, and 10-20mm Sigma wide angle lens. If you read any tutorials online regarding photography, everyone likes to say how little impact the equipment makes in our photographs, but as I go between shooting with my full sensor D700 and this camera, it amazes me the difference in quality between the two cameras and lenses. 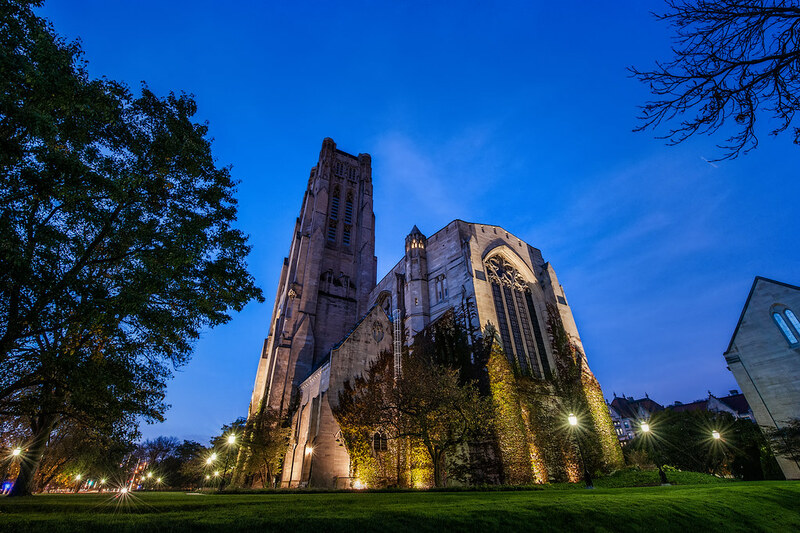 This is the Rockefeller Chapel on the University of Chicago campus in Hyde Park. Rockefeller Chapel at University of Chicago. As described in my guide to composition, I'm always looking to put something in the foreground of my shots, but sometimes there just isn't anything to put there. This was one of those times, and while it may not follow the rules, I think the stillness of the lake and bright colors of the skyline make this shot work. The skyline still on full display of blue and red for the Cubbies. I woke up for an early sunrise shoot at the University of Chicago campus the other day, and the colors are in full swing now. It definitely seems like the fall colors came a little bit later than usual this year perhaps that's due to the warm weather we've been having. 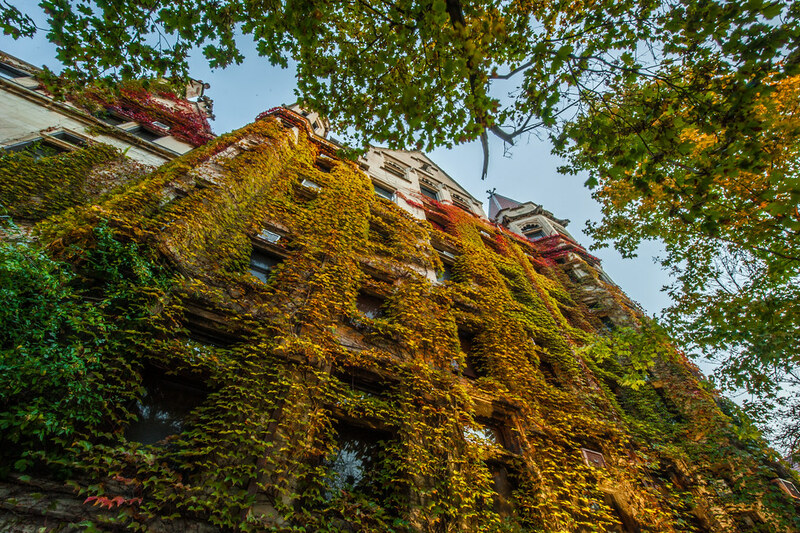 The beautiful ivy on the University of Chicago campus turned to autumn colors. Here is the supermoon taken from the Chicago Riverwalk. I've never really tried capturing one of these "special" moon nights before but I figured it would be worth a try. A quick google of "how to shoot the moon" suggested my longest lens (obviously), shooting with a cable release, sturdy tripod, high aperture, and quick shutter speed. 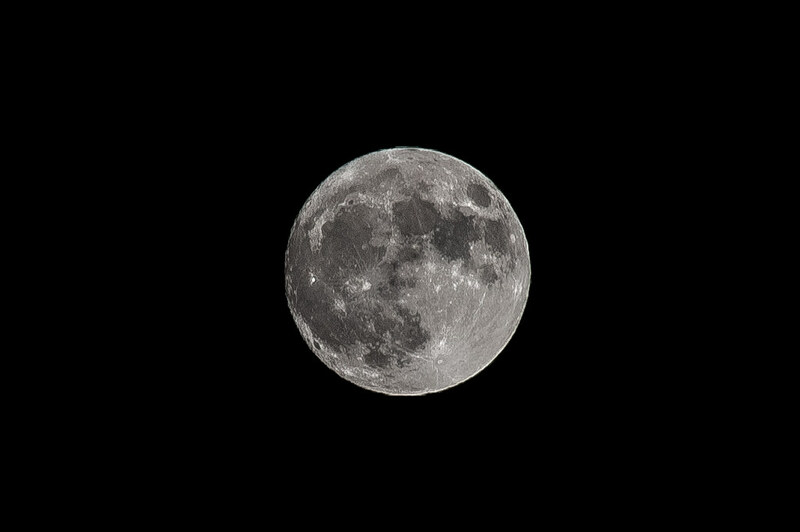 Even with my 200mm lens I had to crop the shot down even further. I didn't apply a ton of post processing here, just added some contrast, clarity and turned down the blacks to make them pure black. Last night's supermoon from the Chicago Riverwalk. I spent about an hour laying face down in the parking lot of the Lincoln Park zoo trying to compose some photos incorporating reflections of the skyline onto them. I got a few funny looks from passersby, but it was all worth it in the end. 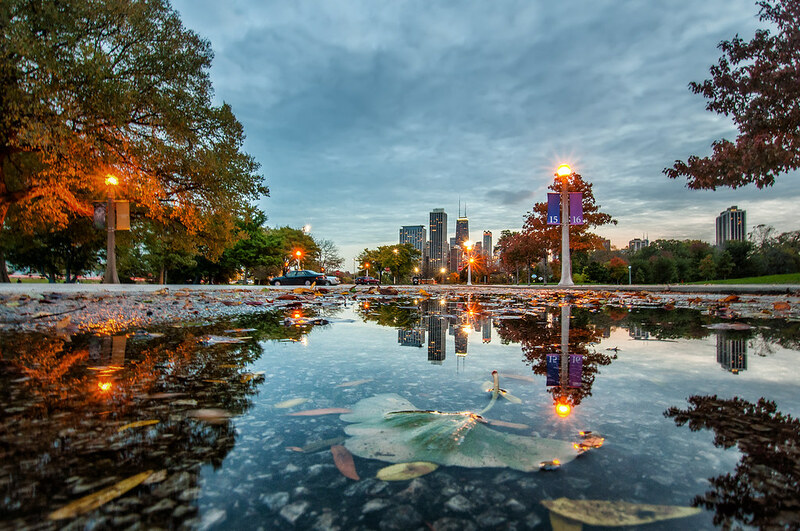 The skyline reflected into a puddle with some autumn leaves at the Lincoln Park Zoo. Today's post is yet another from my shoot at the rooftop of Tribune Tower. As described in my Guide to Composition, when going for a symmetrical shot like this it's incredibly important to get the shot lined up nice and straight, and this is not something that you want to try and save for post. 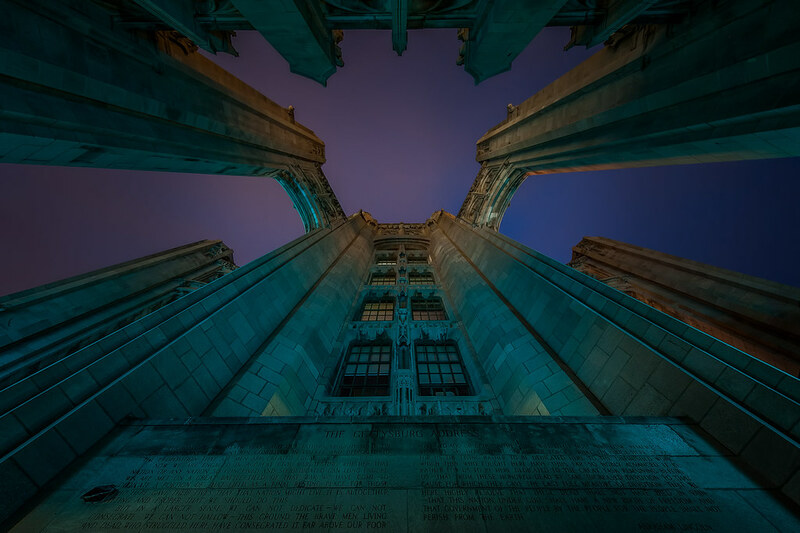 Another angle of the crown of the rooftop at Tribune Tower. 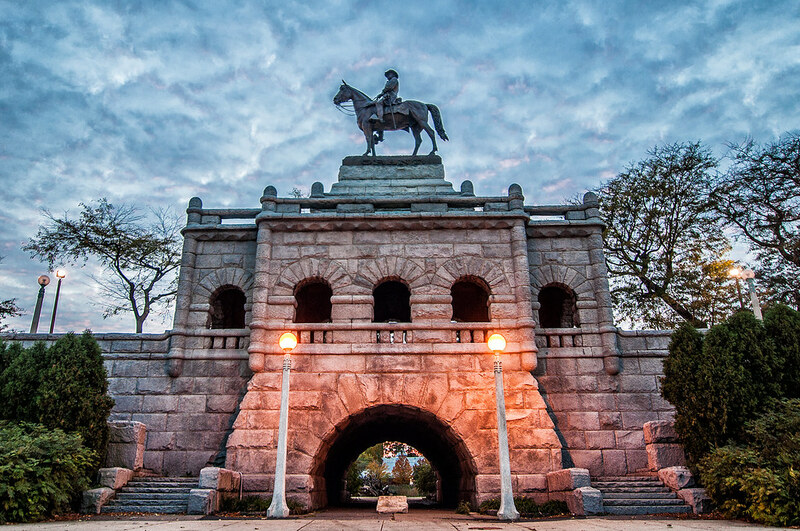 This is the Ulysses S. Grant Memorial statue near the Lincoln Park Zoo. I've always had trouble getting a good photo of this statue. It seems like it should be so easy but something about the elevation of it makes it difficult to incorporate in the nearby scenery of the zoo and even Lake Michigan. Here I went for a straight on symmetrical composition at sunset, incorporating the colors from behind the statue.